These guys are in some hooot soup. Lol. I mean, shouldn't they lead by example? BRF you're the man! 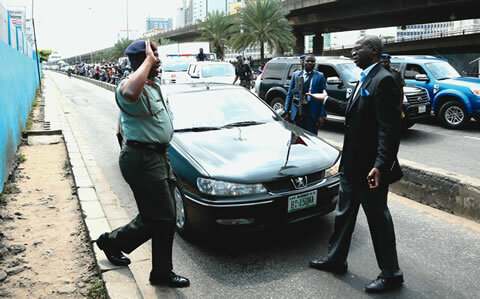 Lagos State Governor Babatunde Fashola on Tuesday reprimanded two military officers for driving on the dedicated Bus Rapid Transit lane. The soldiers were accosted on the BRT lane at the Outer Marina on the Island. Fashola expressed dismay that those who should show discipline and professionalism were the ones violating the BRT regulation. Colonel K.I. Yusuf drove an Army Green Peugeot 406 with registration number BO1 – 150 NA, while Staff Sergeant A.J. Adeomi drove a black Toyota Camry. The incident was said to have drawn the attention of commuters and other passers-by who reportedly commended the governor for showing good leadership. Fashola, after the incident, said it was unfortunate that those who ought to be defenders of democratic values were the ones violating the law. The governor added that he had complained to the superiors of the culprits, saying they would be sanctioned appropriately. He said his apprehension of the military men signified his commitment and that of his government that all violators of the law should be sanctioned. He said, “There is a zero tolerance for lawlessness. There is zero tolerance for breach of our regulations and we are going to do more of this. We are going to take control of our traffic. We cannot build our way out of traffic congestion; our responsibility is to manage traffic and manage congestion. “I don’t use the BRT lane, I sit down in traffic and I expect everyone who wants to drive his car to do the same. The alternative is to use the bus.